"I can't tell if this is nerves or the five breakfasts I ate before coming here!" Absolutely average, that would be the way to describe Stahl. He is average Pernese height, about what the average build would be for a dragonrider, and he just... never seems like he is anything but average. He has a friendly smile on his face and his hair always looks like he just rolled out of bed. Nothing he seems to be able to do actually fixes that, though both he and Kinlath have tried and tried a lot. He likes wearing greens and grays, though even then he doesn't really stand out. He almost always seems to have snacks and nearly-endless pockets... of snacks. Due to a threadfall injury, Stahl has a permanent limp. Stahl remains average. But he's a kind man who will drop what he's doing to help someone in a moment's notice. He is the absolute baseline which a lot of dragonriders are judged by, and he's pretty fine with that. He's okay being the bar, and he doesn't particularly stand out in any sort of combat skills or otherwise. He has his place in the world and it is good to him. Stahl tries to keep something useful on his person at all times, usually it is food. He will eat anything and everything, and is basically a bottomless pit. He loves to cook too, so he's very eager to replenish whatever stores he decimates due to nervous snacking. That said, Stahl has a stubborn streak a mile wide. If you tell him he can't do something, unless it is exceedingly dangerous, he will try to do it. And usually he succeeds, but there is a streak to him that says he needs to prove the naysayers wrong. Stahl is a little ditzy and prone to occasional forgetfulness. He has run out to Threadfall without his jacket more than once. And fortunately he has Kinlath to keep his head on his shoulders. 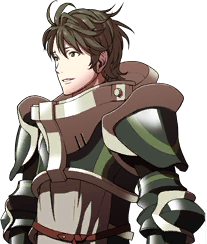 Stahl has a passable knowledge of herbs and plants, picked up from his father in his youth. While he has no real healing training, he's useful in identifying what might be useful in a dire situation. Born in a small cothold outside of High Reaches to a mother who was never around and a father who had a very specialized interest in healing, Stahl was eternally average. He was never the fastest but never the slowest, and despite their mother never being around, he was almost eternally at his father's side. He picked up a lot of what he thought was useless information, but he took care of himself, and his little brother when Halast came along. Golre's last gleaming demanded him, and he was all-but conscripted from his home among others when he was 15. He stood, and stood, and adjusted to what a terrible sort of place the Reaches was. And even when she fell, he just... adjusted. At 19, his luck finally came to him. One average young man gained an above-average dragon. Blue Kinlath, somewhat mute, but to Stahl the blue was everything. He wrote countless letters home, and as soon as they were doing errand-running, he was visiting his father and brother. Kinlath made him happy. Graduation came and he was shuffled into his wing. Stahl remained average, and did everything he could. It was hardly much in his eyes, he always worked to do more, but he always was just average. Even when Threadfall came and decimated the wing, even he got off with only "average" injuries. He knew it could be worse, he always knew. Now he just works. There's too much in the weyr that needs help, and he needs to help them. There's enough, and he needs to keep working. He knows the Weyr needs a gold, and he knows they need moderation... but Stahl isn't a leader. 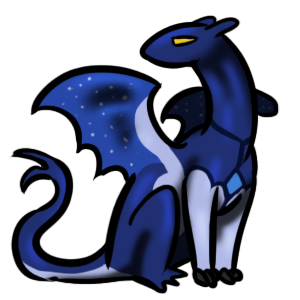 FULL APPEARANCE: Kinlath is a fairly average sort of blue, at least in his proportions. He's not particularly big, or long, or with giant wings, but he is good enough for himself. He's got a good stride and is a fairly good flier, and he is incredibly durable. This blue can take several hits and keep on going. He has somehow mastered the art of tuck-and-roll, for a creature with six limbs. He is a bright, vibrant blue all over, with pointed headknobs. There are dark blues swishing across his wings, and over his legs as if he is wearing some fine boots and gauntlets. His tail has the same color over the forks. There are the same dark spots over his neck, with a super bright swish over his head and down his neck. There are bright spots and two triangles over his forelegs. 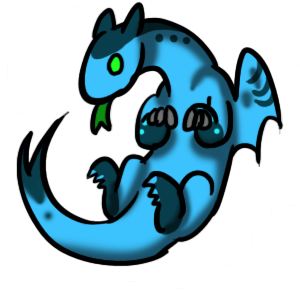 PERSONALITY: Kinlath is a fairly chipper blue. He believes in the best in everyone, that he can and will do great things. However, he does have occasional confidence issues, but he knows that if he keeps working hard, he will succeed. He is a dragon who is hard to deter, if he has a job, he will do it. He's pretty dependable, and he likes to have something to do. Nothing makes him happier than seeing the people he likes smile. He is a sweet darling. Kinlath is a very outdoorsy dragon. He finds himself most at ease when he is out in the sunlight. He has a fondness for stargazing, or watching thunderstorms. To his human, Kinlath is a wonderful sort of partner. He's supportive, even if he doesn't always know what they want, and he is incredibly protective, especially when Gadoroth and Skyloth are involved. He does not trust them, and will not let his human alone with them. He considers Hyliath one of his best friends. Kinlath is a little awkward around authority figures, but he is an incredible judge of character, and it is hard for him to get upset. He has a problem with knowing when to stop working and rest, his partner will have to remind him to sleep. Voice: Kinlath doesn't really have a mindvoice. He communicates like a firelizard, with lots of chirps, squawks, and the occasional roar, along with mental images, emotions, and colors.